The Audemars Piguet factory, which announced its departure from the SIHH, will make its last round at the show in 2019, to move towards more personal presentations directly to customers and enthusiasts. And it was during the Invitational Golf Tournament in Dubai that she previewed her models to 72 watch collectors from all over the world who attended the tournament and enjoyed an unforgettable experience alongside some of Audemars Piguet's ambassador golfers. Nine Audemars Piguet pro golfers, including 2016 Masters Champion Danny Willett who just completed an emotional victory in Dubai yesterday, Ryder Cup constant Henrik Stenson, South Africa’s Branden Grace, former world number one Lee Westwood, Englishman Lee Slattery, former Ryder Cup Captain Darren Clarke, rising star Matt Wallace who finished second in Dubai yesterday, charismatic Andy Sullivan and Austria’s exceptional talent Bernd Wiesberger, extended their final week of the European Tour season to join the Manufacturer’s second global golf event of the year. Me and My Golf, the world number one golf Youtubers, hosted an exciting challenge on the driving range, which quickly turned into a battle for the honour between the highly competitive pros. Following this entertaining warm-up, the ambassadors led their respective teams of watch enthusiasts around the golf course, sharing valuable tips with them. As the Audemars Piguet Dream Team celebrated the end of the season at the Els Club, the Manufacture announced the coming year with a glimpse at its 2019 Royal Oak Offshore collection. 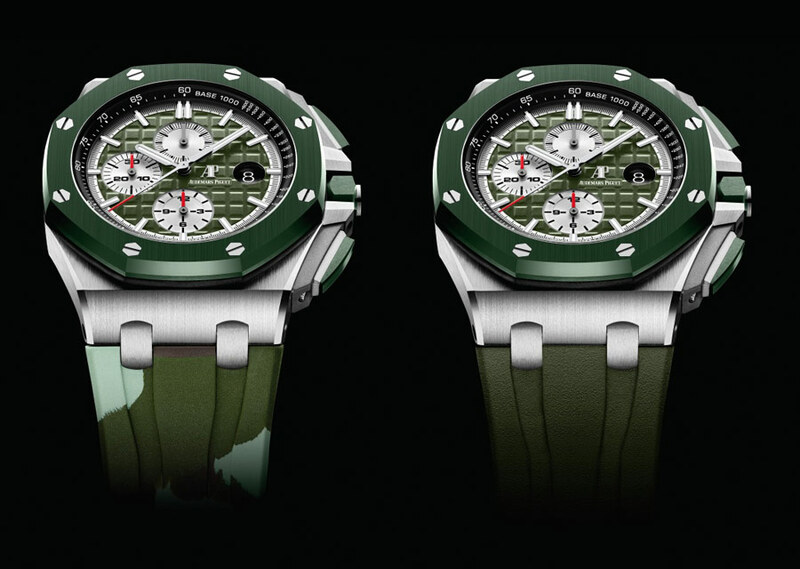 This included a preview of three new Royal Oak Offshore Selfwinding Chronographs in camouflage colours to be officially launched at the Salon International de la Haute Horlogerie (SIHH) in January 2019. 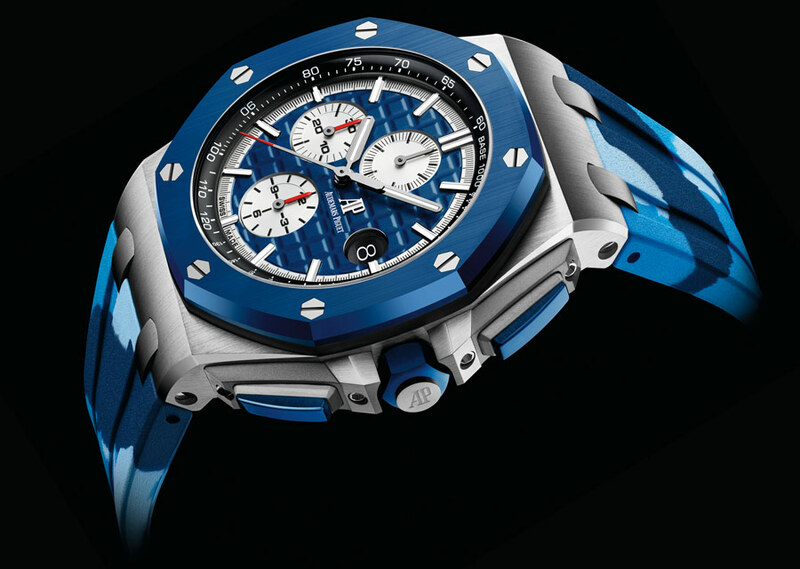 Since its first launch the Royal Oak Offshore has always been associated with new materials. The tradition continues this year with these new 44mm chronographs which combine ceramic bezel, push-pieces and screw-locked crown, Méga-Tapisserie dial and robust rubber straps. 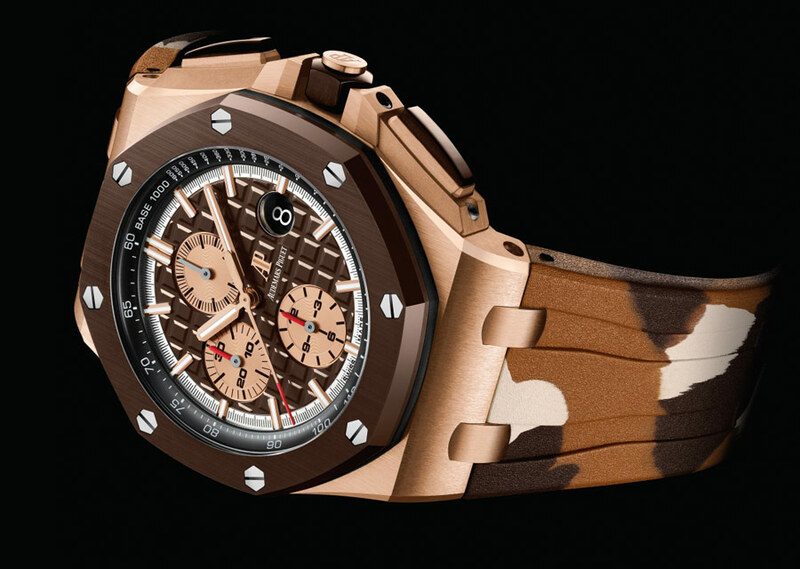 While the blue and green ceramic models feature a stainless steel case, the brown ceramic model – a first for Audemars Piguet – is endowed with a pink gold case that nicely sets off the bezel. Harder than steel, ceramic withstands high temperatures, thermal shock, scratches and…the passing years! Colouring ceramic requires a complex research stage to find the right pigments, as well as a long and delicate manufacturing process.